The Scene Layers team is excited to announce new editing capabilities at ArcGIS Pro 2.2. This blog will preview this story with a quick overview and then a deep technical dive for all those interested. What is a Scene Layer? 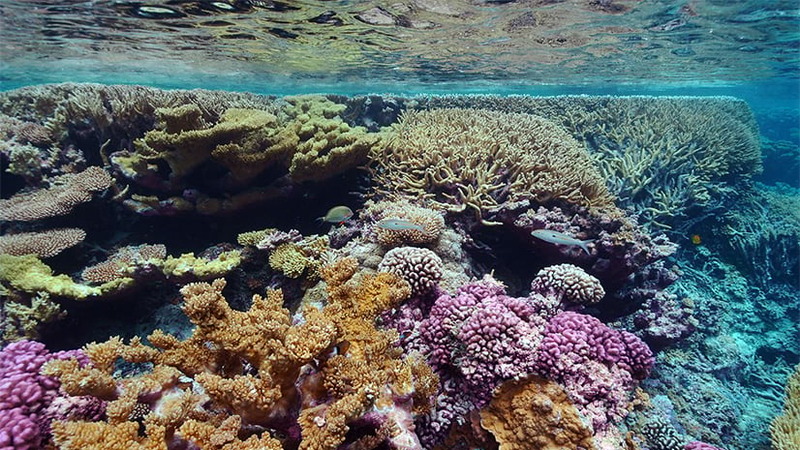 Scene layers are optimized for displaying large amounts of 3D data in a scene. Scene layers are used across the ArcGIS platform in applications like Scene Viewer, ArcGIS Earth, and ArcGIS Pro. A scene layer displays one of four data types: points, point cloud, 3D objects, or an integrated mesh. The scene layer complies with the Indexed 3D Scene layer (I3S) format. The I3S format is an open 3D content delivery format used to disseminate 3D GIS data to mobile, web and desktop clients. Keeping in mind that we are working with cached datasets, the scene layer needs to have a system of record with it in order to edit on demand. This is known as a scene layer with an associated feature layer. This associated feature layer adds to the functionality of the the scene layer, including editing, and providing richer statistical information for symbolization. How do I create a scene layer with an associated feature layer? Only two types of scene layers support this workflow and that includes point and 3d object scene layers. Currently, ArcGIS Pro is the only authoring client that is capable of sharing scene layers with an associated feature layer to your portal. See Web Scene Layer for detailed steps. How do I know if I can edit the scene layer? 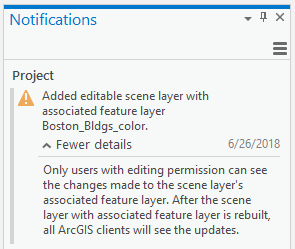 If you are unsure that you can edit a scene layer in ArcGIS Pro you can verify by going to the edit tab > status to view the editing permissions for the layer. See Editing Permissions for more details. You will also see a notification in the notifications pane when an editable scene layer is added. How do I edit the scene layer? After the data has been shared to the portal, meeting the necessary requirements, you can now edit the scene layer. In ArcGIS Pro ensure that you are logged into your portal (either as administrator or user with editing privileges) and it is set as the active portal. Drag the scene layer or feature layer from the catalog pane to the scene. Scene layers shared by reference allow full functionality of attribute and geometry editing. Scene layers shared using the copy all option will require use of the scene layer or feature layer depending on which type of edits being performed. See the table at the end of this blog to determine which web layer to use. Begin attribute edits using the attribute table, attribute pane or geoprocessing tools. Geometry edits can be performed using Move, Rotate, Scale tools. What do I do after editing? After edits have been applied, the scene layer may need to be rebuilt to reflect the changes stored in the system of record, the associated feature layer. Rebuilding the cache of a web scene layer on ArcGIS Online consumes credits. For more information on credits, see Understand credits. 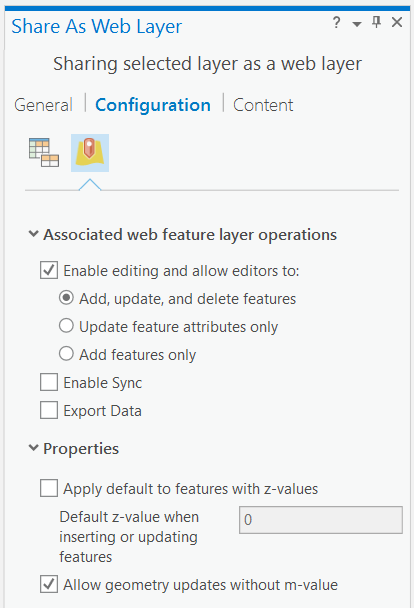 Open the item details page of the web scene layer in ArcGIS Online or ArcGIS Enterprise. Click the Settings tab and click Manage Cache. The Manage Cache dialog box appears. On the Manage Cache dialog box, check the layer to be rebuilt. All edits stored with the associated feature layer are now part of the scene layer and can be viewed by all users who have access to the scene layer. ArcGIS Enterprise supports editing scene layers with associated feature layers for 3D object and 3D point layers. ArcGIS Online only supports editing on point scene layers, not 3D object layers. There may also be unsupported properties set in the layer prior to sharing as a scene layer and they will need to be resolved before sharing can commence. An example, is a multipatch feature layer can only have an absolute elevation setting. Once the data is properly authored you can move to the sharing stage. When sharing to ArcGIS Enterprise, you can choose to reference registered data or copy all data. Sharing to Portal for ArcGIS 10.4 and later has these data options. If you do not want the web layer to have access to the registered data source, choose copy all data. When using copy all data, ArcGIS Pro copies all layers in the map to the server. This includes registered data. The web layer will use the data copied to the server. At this release, editing a by reference scene layer provides full functionality in terms of editing. 3D Object and point scene layers published by reference allow attribute, and geometry edits via the web scene layer. If you used the copy all option you will need to review the information below as to whether or not you need to edit the web scene layer or the associated feature layer. Note: Scene layers shared using the copy all option do not support schema changes at this release. Schema changes include adding and deleting fields. Where can I perform attribute editing on a scene layer? Note: Edits made to a point scene layer shared using the copy all option are not currently possible via the attribute table or attribute pane. Please use a geoprocessing tool such as calculate field tool or add the associated feature layer which allows edits via the attribute table. Where can I perform geometry editing? Editing tools such as Move, Rotate, Scale tools. Note: Geometry edits made to a point scene layer shared using the copy all option are not currently possible. Please add the associated feature layer to perform geometry edits. 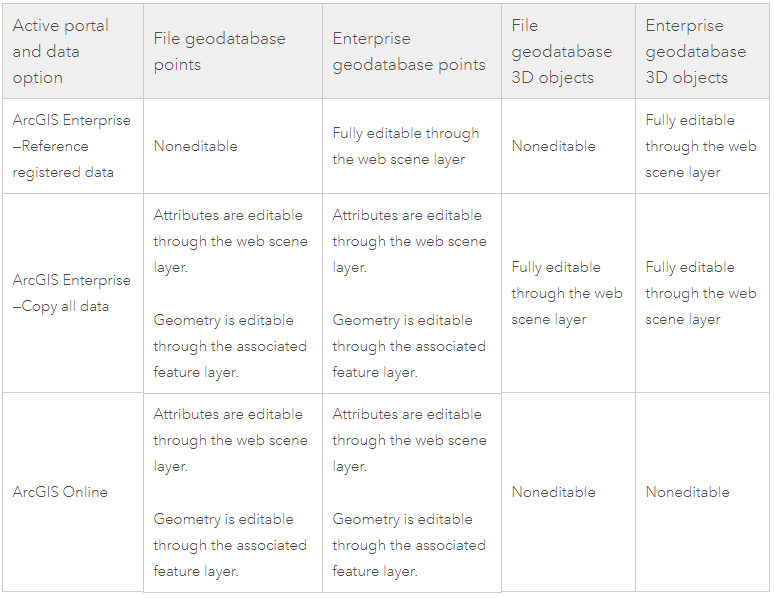 See the table below for when to use a web scene layer as opposed to a web feature layer. Which web layer to edit? Where can I find detailed steps? For steps on attribute and geometry editing see edit scene layer with associated feature layer. Andrew is a product engineer on the Scene Layers Team.